Welcome to Tablescape Thursday. I am so glad that you stopped by, and I hope that everyone is having a great week. Weather permitting, I love to entertain and serve meals outside. However, the Oklahoma winds don’t always cooperate. Hence, the Oklahoma song verse “where the wind comes sweeping down the plain.” During, the Spring and Summer, it’s not unusual to have 25 mile per hour winds during the day, and storms can create much faster winds. This can really aggravate me when I have plans to entertain outdoors. Many a time, I have had to change course and move everything inside. Today’s tablescape is simple and perfect for a Summer dinner outside. I love using bright colors in the Summer and chose blue and red for my color palette. I also added in my Great Grandmother’s American Fostoria to the tablesetting. I chose simple red plates, blue searsucker napkins, and my Great Grandmother’s American Fostoria for the place setting. I chose a rooster set along with candles for a simple centerpiece. It added just the perfect pop of red to the table and tied in the red plates. 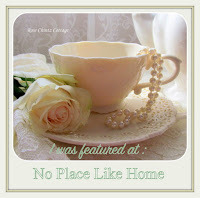 I’m so glad that you visited my blog today. I can’t wait to share with you something special that I received today from sweet and thoughtful husband. For lovers of French Country, you are not going to believe it. I will share it with you next week. It is a true treasure. I’m still pinching myself in disbelief. I will give you one hint it is something from one of the most beloved French Country Interior Designers. You will have to stay tuned next week. For now, I wish you a very happy Thursday and a wonderful weekend!!! Thank you Pam! I’m glad you like color too. I am such a color person!!! Thanks so much for stopping by, and I hope that you have a wonderful day! Beautiful tablescape Shannon….Love those seersucker napkins…and I am partial to those beautiful American Fostoria….as I have a collection of it. I love the pattern and so versatile in any table setting. And I am on the edge of my chair in seeing what fabulous thing your hubby gave to you! Thank you Shirley! I can tell by your beautiful house that you love French Country like I do, and I know you are going to appreciate what my husband gave me. It’s all I can do not to tell you right now. I promise I’ll share it on Monday. I hope that you have a wonderful weekend!!! Lively summer tablescape with vibrant blue and red. Great job! Carol, thank you for the gracious and kind comments. I’m so glad that you stopped by, and I hope that you have a great weekend!!! Thank you for the sweet comments Rhonda! I can’t wait to share my surprise with you Monday so stay tuned. I hope that you have a wonderful weekend!!! Such a pretty table! Visiting from Show Off Saturday. I love French Country. Oops, I meant Pieced Pastimes! Thank you so much Carole. I’m so glad that you stopped by. I’m so glad that you love French Country. You will have to check back Monday, because I received a most wonderful early birthday present. You are not going to believe it. I still don’t! I hope that you have a great Saturday and a wonderful weekend! Wonderful, patriotic table-scape. Loved the red chickens with the polka dots … I do love polka dots! Thank you so much!!! I’m so glad that you stopped by!!! Loving your bright and colorful table! It could be patriotic or for summer or almost anytime. That hen in the center is just adorable! So glad you joined us at the Dishing It & Digging It Link Party. I hope it brings you some new traffic and friends. Thank you for the sweet comments Christine! I hope that you have a wonderful week!! !